Several measures show declining labour quality, especially in Western Canada, where employers faced severe shortages. Employment rose faster last year for the youngest and oldest segments of the population — the least productive — than workers in their prime (between 25 and 54 years old)... In Alberta, people with high school education or less accounted for over half of all employment growth in 2006. This was by far the most ever, and a marked change from the 1990s when employers showed a marked preference for people with more than high school education. Business investment points to better productivity growth. Fuelled by record high profits, firms have stepped up investment outlays by a steady 10% in each of the last three years. The increased competitive pressure on firms caused by the sharp rise in the exchange rate since 2003 would be a major incentive for firms to spend more. Similar pressures in the U.S. early this decade led to a sharp improvement in productivity... [I]t is rare for productivity to slump for an extended period when investment is expanding. This is encouraging for a rebound in productivity growth in the short run, holding out some prospect that the current slump will not be as prolonged as in 2002-2003. One factor that may explain the divergence of investment and productivity in 2006 was that so much of investment was driven by the energy sector, where the pay-off in higher output will not materialize until later. Ever wonder why so many economists are sceptical about man-made global warming? It's because we've had a lot of humbling experience with just how quickly large scale computer models can go very badly wrong. Remember when we had inflation and unemployment under control through Keynesian fine-tuning? Dave Fultz was a meteorological theorist at the University of Chicago, who asked the following question: what factors are essential to generating the complexity of actual weather? Is it a process that depends on the full complexity of the world -- the interaction of ocean currents and the atmosphere, the locations of mountain ranges, the alternation of the seasons, and so on -- or does the basic pattern of weather, for all its complexity, have simple roots? He was able to show the essential simplicity of the weather's causes with a "model" that consisted of a dish-pan filled with water, placed on a slowly rotating turntable, with an electric heating element bent around the outside of the pan. Aluminum flakes were suspended in the water, so that a camera perched overhead and rotating with the pan could take pictures of the pattern of flow. The setup was designed to reproduce two features of the global weather pattern: the temperature differential between the poles and the equator, and the Coriolis force that results from the Earth's spin. Everything else -- all the rich detail of the actual planet -- was suppressed. And yet the dish-pan exhibited an unmistakable resemblance to actual weather patterns: a steady flow near the rim evidently corresponding to the trade winds, constantly shifting eddies reminiscent of temperate-zone storm systems, even a rapidly moving ribbon of water that looked like the recently discovered jet stream. What did one learn from the dish-pan? It was not telling an entirely true story: the Earth is not flat, air is not water, the real world has oceans and mountain ranges and for that matter two hemispheres. The unrealism of Fultz's model world was dictated by what he was able to or could be bothered to build -- in effect, by the limitations of his modeling technique. Nonetheless, the model did convey a powerful insight into why the weather system behaves the way it does. The important point is that any kind of model of a complex system -- a physical model, a computer simulation, or a pencil-and-paper mathematical representation -- amounts to pretty much the same kind of procedure. You make a set of clearly untrue simplifications to get the system down to something you can handle; those simplifications are dictated partly by guesses about what is important, partly by the modeling techniques available. And the end result, if the model is a good one, is an improved insight into why the vastly more complex real system behaves the way it does. Popular usage notwithstanding, climatologists have not 'proven' a link between human production of greenhouse gases and global warming. Rather, according to the models that - in their best judgment - best reproduce the main features of the available climate data, the most likely explanation for the increases in the average temperatures we observe is the warming effect of greenhouse gases. That doesn't mean there isn't a more likely explanation - just that no-one has yet been able to think of one. When it comes to physical science, few people have problems with this idea. When we turn to social science, however, the whole issue of modeling begins to raise people's hackles. Suddenly the idea of representing the relevant system through a set of simplifications that are dictated at least in part by the available techniques becomes highly objectionable. Everyone accepts that it was reasonable for Fultz to represent the Earth, at least for a first pass, with a flat dish, because that was what was practical. But what do you think about the decision of most economists between 1820 and 1970 to represent the economy as a set of perfectly competitive markets, because a model of perfect competition was what they knew how to build? It's essentially the same thing, but it raises howls of indignation. The problem is that there is no alternative to models. We all think in simplified models, all the time. The sophisticated thing to do is not to pretend to stop, but to be self-conscious -- to be aware that your models are maps rather than reality. There are many intelligent writers on economics who are able to convince themselves -- and sometimes large numbers of other people as well -- that they have found a way to transcend the narrowing effect of model-building. Invariably they are fooling themselves. If you look at the writing of anyone who claims to be able to write about social issues without stooping to restrictive modeling, you will find that his insights are based essentially on the use of metaphor. And metaphor is, of course, a kind of heuristic modeling technique. In fact, we are all builders and purveyors of unrealistic simplifications. Some of us are self-aware: we use our models as metaphors. Others, including people who are indisputably brilliant and seemingly sophisticated, are sleepwalkers: they unconsciously use metaphors as models. This doesn't mean that conclusions based on models are always right; quite the opposite. Models are approximations, and approximations are 'wrong' pretty much by definition. The problem is that it's hard to know if the model is wrong in a way that significantly affects its usefulness for policy analysis. Indeed, many advances in economic thought have occurred because a model-based policy went wrong in an unexpected way. A good economist will always make a clear distinction between a model and reality. Since I personally know nothing about climatology, I'm willing to defer to the judgment of those who do. But there's always the risk that climatologists - being human - have gotten it wrong. Greenhouse gases may not turn out to be that big of a deal. On the other hand, they may be even more of a problem than even the worst of the model-based scenarios would predict. When it comes to climate change policy, the most important question may be: Do we feel lucky? It's budget season at the federal and provincial levels, and in its ongoing campaign to improve access to post-secondary education (PSE), the Canadian Federation of Students is campaigning for reduced tuition fees, and is taking to the streets to make its opinion known. Given what we know about this issue, it's pretty clear that the most important obstacle to increasing access to PSE is the Canadian Federation of Students. Reducing tuition fees amounts to giving scads of free money to upper-income households, and will improve PSE access hardly at all. The issue of tuition fees and access to post-secondary education is one that keeps popping up, and it's one that is often a source of frustration to me. One problem is that the basic facts are not well-known. And many of the factoids that have made it into popular circulation are either taken out of context, or simply wrong. So here are some facts, almost entirely lifted from the excellent survey The Price of Knowledge 2004: Access and Student Finance in Canada (393-page pdf), by Alex Usher and Sean Junor. I'm going to avoid editorial comment here, and I'll update it as new data become available. If I've missed something, or if you know of more recent data, please let me know in the comments. People decide whether or not they want to go to university well before they reach the end of high school. University students are more likely to come from higher-income families. Both tuition fees and participation rates have been increasing. Notwithstanding the increase in tuition fees, the percentage of those who cite financial barriers as a reason for not going to university has decreased. The financial benefits from going to university greatly exceed the financial costs. The benefits of going to university are underestimated, particularly among youths from low-income households. Academic costs account for about 25% of the total costs of attending university. Tuition and other fees have been rising faster than inflation, except in Quebec. Student assistance has remained roughly constant over time. There's been a shift away from need-based to universal expenditures in student assistance. Financial barriers explain only a small fraction of the difference between the participation rates of people from low- and high-income families. The trend in real spending per student is positive; but it's a declining share of GDP. Student debt loads have been increasing. The incidence of student debt has also increased. In the case of compliance with emission targets, Annex I Parties have 100 days after the expert review of their final annual emissions inventory has finished to make up any shortfall in compliance (e.g. by acquiring AAUs, CERs, ERUs or RMUs through emissions trading). So we're supposed to buy greenhouse gas emission (GGE) permits. How many? As I noted before, GGEs have been growing at the fairly steady rate of 1.7% a year between 1990 and 2004, a trend that has almost certainly continued to 2007. This means that Canadian GGEs are running around 797mt in 2007. If the trend continues to 2012, they'll be at 866mt, but it will presumably be the case that stronger environmental legislation will be brought in before we get that far. If we can cut the rate of growth of GGE by half over the next 5 years - and this would be quite an achievement - then 2012 emissions would be in the neighbourhood of (say) 825mt. Canada's Kyoto target (96% of 1990 emissions) is 575mt, so we'd be looking to buy emissions for 250mt. How much would it cost? If we take the median forecast of $US 19/tonne at 2000 prices, add inflation and convert to CAD at current exchange rates, that works out to about $C 25/tonne. Multiply that by 250mt, and the Kyoto penalty works out to something like $6.25b/yr. Now if paying $6b a year were the price of actually reducing greenhouse gas emissions to the Kyoto levels, it would be a bargain. But it's not: we'd still be producing greenhouse gases at levels well above the Kyoto targets. 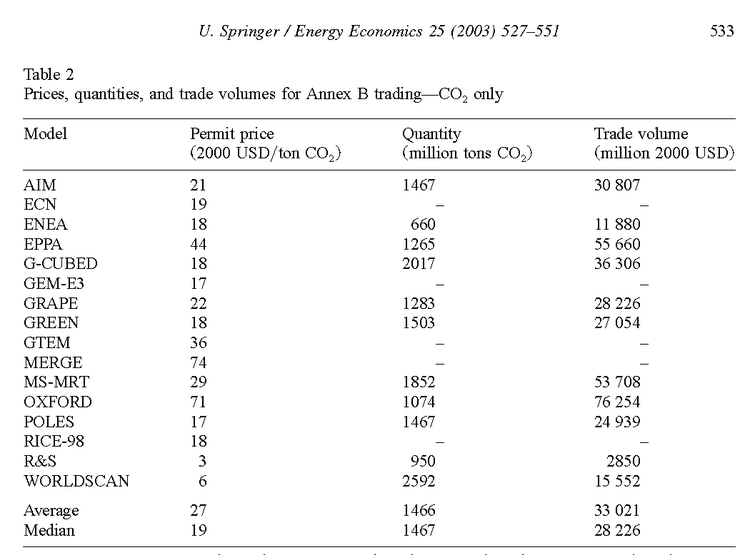 Of course, if the emissions market were to function as it is supposed to, then it would make sense to buy permits from countries that have a comparative advantage in GGE reduction. But without the participation of the US, Canadian purchases of permits would have at best a symbolic value. $6b/year is a lot to pay for a symbol. Where would Canada be without sizzling Alberta? Stalled without it, U.S. economist says: Alberta's sizzling economy is keeping all of Canada from burning out, reckons one U.S.-based economist. Carl Weinberg, chief economist at High Frequency Economics in Valhalla, N.Y., figures that Alberta's economy has been growing at about 7 per cent, year over year. By that measure, all of the other provinces and territories together posted an uptick of only 0.6 per cent in November compared with the same month in 2005, he estimates. On Wednesday, Statistics Canada reported that gross domestic product edged up 0.2 per cent in November compared with October, and 1.6 per cent compared with the same month a year earlier. Mr. Weinberg's research suggests that the steady slowdown in growth that the Bank of Canada has been betting on appears to be more of a stall when Alberta's performance is stripped out. "Most Canadians, we must recall, live outside the special economic zone that is known as Alberta. "Uh oh!," writes Mr. Weinberg in a note to clients. Faithful readers of this blog will be no doubt be familiar with the salient features of the evolution of the Canadian economy over the past few years: higher oil prices have boosted the fortunes of the Alberta-based petroleum sector, and the associated appreciation of the CAD has hurt central Canada's manufacturing sector. Canadian economic growth has been concentrated in Alberta. And it's entirely reasonable to imagine that the recent softening of oil prices will slow the Alberta economy. But lower oil prices will generate downward pressure on the CAD, thereby making the manufacturing sector a source of growth on its own. So if Alberta's economy slows, it will be due to causes that will increase growth elsewhere in Canada. "Uh oh!" indeed: Mr Weinberg's clients appear to be paying for an analysis based on the fallacy of composition.